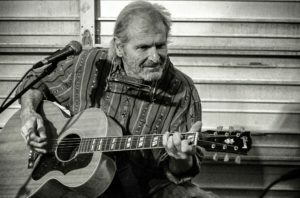 A world traveling troubadour with a long string of recorded songs and albums, Butch Hancock has been called “one of the finest songwriters of our time” and is acknowledged by his peers and critics alike as one of the premiere singer-songwriters Texas has ever produced. His tunes evoke mystical visions of wind-swept dry-plains and his lyrics are profoundly imaginative, often displaying for his listeners the miracles that occur in the ordinary through creative irony and metaphors. His lyrical style has often been compared to that of Bob Dylan and Woody Guthrie and his songs have been covered by the likes of Emmylou Harris. Hancock is also a member of renowned country rock super-group, The Flatlanders, along with his lifelong friends, Joe Ely and Jimmie Dale Gilmore, a band they formed in 1972. During his acclaimed career, Hancock has written and recorded several landmark albums, some of them sparse and simple, others as big as the West Texas sky. After moving to the progressive country hotbed of Austin in the mid 70s, he started his own label (Rainlight) and released the quintessential West Texas Waltzes and Dust-Blown Tractor Tunes in 1978. In the years that followed he continued to release albums deep with meaning and memory, a foundation that cemented his world-wide reputation as a master wordsmith. In 1990, Hancock and more than two dozen musician friends staged a Guinness Book of World Records worthy event entitled No Two Alike and played six straight nights of live performances in Austin’s famed Cactus Café, recording 140 of his original songs without repeating a single song. He released the staggering output later in the year as the No Two Alike Tape of the Month club. This past year, Butch reprised the event, this time entitling it, No Two More Alike.